Two is definitely better than one when it comes to monitors. A single display may suffice for basic computing, but multiple monitors make a big difference for heavily graphical work, intensive multitasking—and of course, serious gaming. LCD prices continue to drop, too, making multimonitor setups more affordable. But before you go on a monitor-buying spree, make sure your computer can support more than one display. This usually isn’t a problem with recent desktops, but it can be with laptops. 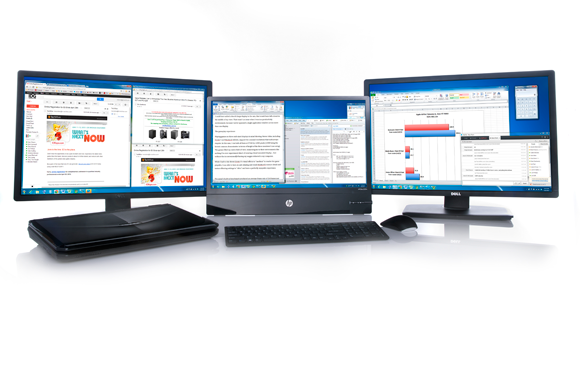 After confirming that your system is multimonitor-ready, check out these tips for setting up those displays to maximize your productivity. Once you’ve decided how many monitors you need, try to buy them all at the same time rather than piecemeal. The model you buy today may not be available in two months, and pairing different models can leave you to deal with variations in bezel thickness, screen resolution, or even screen size. The result, all too often: Monitors don’t line up properly, navigating your displays becomes unnecessarily difficult, and your productivity suffers. Choose monitors equipped with DisplayPort 2.1 so you can daisy-chain monitors easily. In addition, you can future-proof your purchases by getting monitors equipped with DisplayPort 1.2, which supports daisy-chaining. When working with multiple monitors, it’s important to arrange them so as to achieve the most comfortable viewing angles. Using monitor arms like those from Ergotron, and monitors with VESA mounting support, you can pan, tilt, rotate, and lift the display to the optimal position. Higher-end monitors typically have their own adjustable stands, but monitor arms are superior in most cases—especially because they can retract to the edge of the desk to maximize available desktop space. Arranging monitors in portrait mode is one unorthodox option that permits you to squeeze in more monitors. (We recently reviewed a few monitors that can pivot into portrait mode.) Portrait mode is excellent for first-person-shooter games, but some desktop application windows may feel cramped and awkward in that orientation. Using monitor arms to stack a second row of monitors above the first row may enable you to position more monitors comfortably. Regardless of how you decide to arrange your monitors, take time to wire everything up neatly, using either cable ties or a cable wrap. With good planning and some work, your multimonitor setup doesn’t have to be overrun with cables. Practically all monitors these days come with multiple input ports, including DisplayPort, DVI, HDMI, and VGA. You can use one port for your primary computer, and the others to connect to a nearby server or a test machine. Alternatively, you could connect an Xbox 360 or PlayStation 3 via the HDMI port. Obviously, a video switcher box would do the same thing, but that’s an additional piece of hardware to purchase, and it also adds to the clutter on your desktop. Microsoft has steadily tweaked the Windows operating system to work better with multimonitor systems, by introducing a number of noteworthy shortcuts. Using the Windows-Left arrow key or Windows-Right arrow key combination, for example, will dock the active window to the side of the current monitor. Additional key presses will move the docked window to the next monitor, while Shift-Windows-Left arrow or Shift-Windows-Right arrow will move the window to the next monitor without docking. 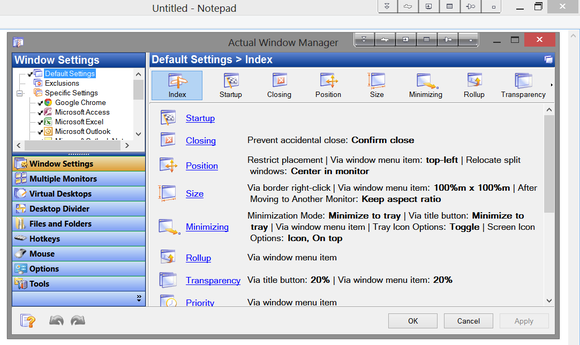 Use a monitor manager to help you work better with your extra screen real estate. But third-party window managers can still help you navigate across multiple monitors more easily. These programs add features such as creating a taskbar across monitors (for Windows 7 and earlier, since Windows 8 has this built in), remembering the position of app windows, offering shortcuts keys for managing app windows, and more. Finding the mouse cursor can be tricky when you have multiple monitors to check. Finally, you may want to enable mouse acceleration on your multimonitor system. Mouse acceleration significantly increases the speed of the mouse cursor when fast mouse swipes are detected. It’s especially useful for moving quickly across multiple monitors. Relying exclusively on a trackpad to navigate a multimonitor system can be a pain, due to the excessive amount of swiping needed. Other mouse-related configurations include changing your mouse pointer’s size and color to make it stand out more. Finally, consider selecting the ‘Show location of pointer when I press CTRL key’ option under Mouse Properties > Pointer Options, as well as the ‘Snap To’ feature to move the mouse cursor to the default option of a dialog box automatically. Once you’ve worked with multiple monitors, you’ll have a hard time going back to a solo monitor. All that space. All those windows open at the same time. As the computing world becomes increasingly graphical, expanding your view will prove well worth the extra real estate on your desk or wall. The most recent port technologies and Windows enhancements make upgrading even easier. Or perhaps you already have two, three, or four displays set up? Let us know how it works for you.